COB 900/1200/1500/1800W LED Grow Light Full Spectrum Indoor Veg Flower Plants. No extra ballast is needed. Ultra bright, do not look directly when working. Don't touch or move when the light working. To protect the lights, please cut off the power when there is a lighting strike. Tips for increasing lifespan: please let the light have a rest for about 20 mins after 7-8 hours working. The light use the latest COB (Chips on Board) technology. COB technology is an emerging trend in horticultural lighting, which is a new way of packaging LEDs. Multi LED chips are packaged together as one lighting module. When it light up, it looks like a lighting panel. New technology with advantage of saving energy. And each part functions independent of the others , so if one circuit board or LED fails the rest of your light keeps working. Exclusive Dimmer design :brightness dimmer is on the back of the light, you can adjust brightness from 0%100%. Adjust brightness to apply for different plants growing stages instead of adjust light hanging height, very convenient. Best solution for different plants growing stages, you can adjust brightness to make light use under different stages. Ideally suited for various stages of plant growth, and can be a good indoor garden soil or culture solution cultured plants. The most efficient spectrum for growing plants, based on over 5 years of research and testing. The color ratio is similar to the sunlight, include Red(620-630nm;650-660nm); Blue(440-450nm;450-460nm); Orange(600-610nm); IR(730nm); White(3500K;6000K) , UV(395-410nm). The blue and red are main wavelengths. Red light wavelengths are 630nm and 660nm, Blue wavelength is 460nm, red light promote plant germination, flowering, fruiting, blue promote plant growth, root length, leaf length. Built-in Powerful Cooling fans system, three fans in the light. Some holes on the led board(thickened, ours:3.0mm, others:1.6mm) form convection, no glass, it's better for cooling. Exhaust port all round the outer casing, very easily manageable temperature, keep the lights working longer. Plant biologists define light in the 400nm to 700nm spectral region as photosynthetically available radiation, or PAR. The unit for measuring PAR, micro-mols per second (mol/s), indicates how many photons in this spectral range fall on the plant each second. Coverage Area: 4.5 x 5.0 Square Feet. The light irradiated area and height will change accordingly depending on the. Plants and the environment, and the technical parameters will change. Suggest distance above plants: 2-3.5ft. Perfect for growing area at 2 ft height. Vegetative Stage: 12-14H on; Flowering Stage: 9-12H on. Fruiting Stage: 7- 8H on. 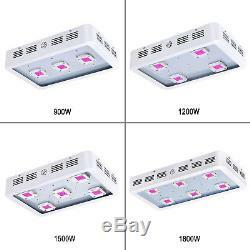 1 x COB 900/1200/1500/1800W LED Grow Light. 1 x Free Hanging Kits Easy Installation. 1 x Free 6ft Power Cord. Testimonials For Different Type of our products. Our products are guaranteed for a period of 3 years under normal use. (GMT+8) of Monday to Friday. If you don't receive our reply, please kindly re-sent your message and we will reply to you as soon as possible. We will try our best to assist you all the way. The item "COB 900/1200/1500/1800W LED Grow Light Full Spectrum Indoor Veg Flower Plants" is in sale since Friday, January 19, 2018. This item is in the category "Home & Garden\Yard, Garden & Outdoor Living\Gardening Supplies\Hydroponics & Seed Starting\Grow Light Kits". The seller is "geniusled" and is located in Shen zhen.